The 2018-19 Pettisville boys basketball team. 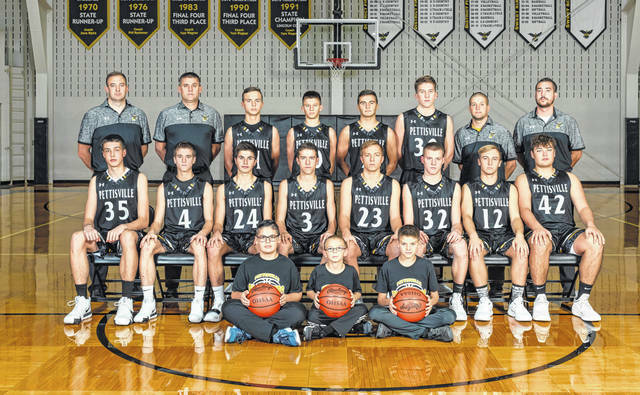 Pettisville boys basketball has a pair of first team All-Buckeye Border Conference performers returning as they look to defend their league title in 2018-19. Overall, they return their top three scorers from last season in terms of points per game average. Detric Yoder returns for his senior season, after he was first team All-BBC and in District 7, as well as honorable mention All-Northwest District. Yoder came in at 11.1 points and 4.3 assists per game a season ago. Another key returnee is junior Graeme Jacoby. He was first team All-BBC, second team District 7 and honorable mention all-district. “Graeme Jacoby returns for us after a solid sophomore season at the center position as our second leading scorer and top rebounder,” stated Leppelmeier. Jacoby averaged 9.7 points and 6.6 rebounds per game last season. Senior guard Canidate Vickery also returns after receiving honorable mention All-BBC and District 7 honors for the Birds. “Canidate Vickery, third leading scorer and third leading rebounder, had solid junior season in the back court with Detric,” said Leppelmeier. Vickery averaged 8.2 points and 4.2 rebounds per game in 2017-18. Other returning letter winners for the Birds are Sam Rychener, Logan Rufenacht and Austin Horning. Newcomers looking to add depth are Mitchell Avina, Eli Grieser, and Caleb Keim. “A challenge at the beginning of each year for our returning players is learning and accepting new roles on the team,” said Leppelmeier of potential weaknesses heading into the season. Another potential problem area will be having to replace three letter winners. Gone are Dillon King (second team All-BBC, honorable mention District 7), Justin Rupp (honorable mention All-BBC, District 7), and Landon Roth. However, the Birds are in position to repeat as league champion. Pettisville travels to Montpelier Friday and hosts Delta Saturday to begin the season.